Like California Life and WIN Two Passes to Hangar 18 Climbing Gyms! If you love to monkey around, then Hangar 18 Indoor Climbing Gyms are the perfect spot for you! Each of Hangar 18’s six locations throughout Southern California features more than 55,000 feet of textured climbing terrain, world-class bouldering and massive lead caves featuring routes up to 70ft long. Hangar 18 also offers a variety of fitness and yoga classes. 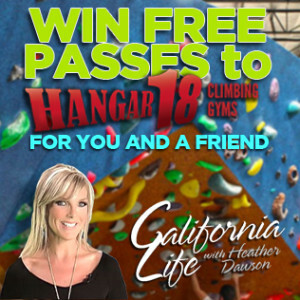 Hangar 18 Rancho Cucamonga is giving away two FREE passes for you and a friend, WEEKLY! For much more on Hangar 18, check out the story below from our sister show, RC Spotlight!